The pyramids of Giza have stood for more than four thousand years, fascinating generations around the world. We think of the pyramids as mysteries, but the stones, hieroglyphs, landscape, and even layers of sand and debris around them hold stories. 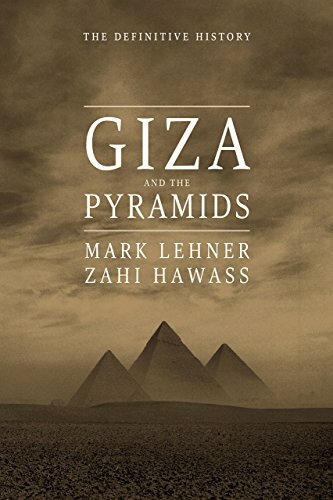 In Giza and the Pyramids: The Definitive History, two of the world’s most eminent Egyptologists, Mark Lehner and Zahi Hawass, provide their unique insights based on more than four decades of excavating and studying the site. The celebrated Great Pyramid of Khufu, or Cheops, is the only one of the seven wonders of the ancient world still standing, but there is much more to Giza. Though we imagine the pyramids of Khufu, Khafre, and Menkaure and the Sphinx rising from the desert, isolated and enigmatic, they were once surrounded by temples, noble tombs, vast cemeteries, and even harbors and teeming towns. This unparalleled account describes that past life in vibrant detail, along with the history of exploration, the religious and social function of the pyramids, how the pyramids were built, and the story of Giza before and after the Old Kingdom. Hundreds of illustrations, including vivid photographs of the monuments, excavations, and objects, as well as plans, reconstructions, and images from remote-controlled cameras and laser scans, help bring these monuments to life. Through the ages, Giza and the pyramids have inspired extraordinary speculations and wild theories, but here, in this definitive account, is the in-depth story as told by the evidence on the ground and by the leading authorities on the site.